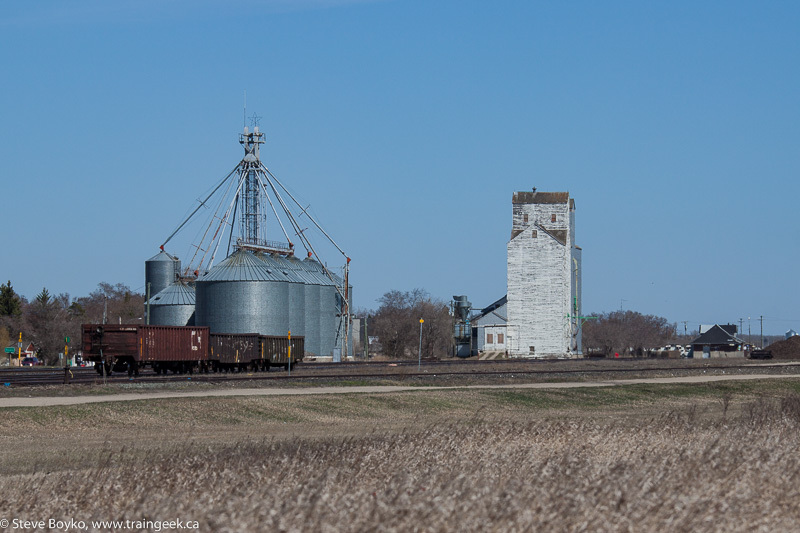 After the two elevators of McConnell, I was abruptly returned to the present with the modern grain elevator at Oakner. The Oakner elevator is near mile 159 of the CN Rivers subdivision. 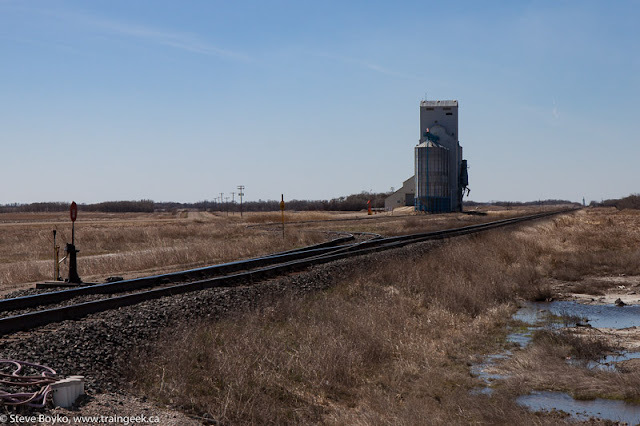 This Cargill facility has a capacity of over 14,000 tonnes and has three tracks for loading grain. Unlike other Cargill elevators in Manitoba (Morris, Nesbitt/Page, Elm Creek, and Elva), Oakner doesn't have its own locomotive for switching. Apparently Oakner and other Cargill facilities recently had PLC upgrades. A PLC (Programmable Logic Controller) is a kind of industrial computer that is used to monitor and control machinery. This is in the line of work that I do so I was interested to find this blurb from Delco Automation. Beyond grain storage, the Oakner facility has a number of other outbuildings including fertilizer storage. Sadly no trains came along. There is not much of the town of Oakner remaining, just a few nearby buildings. I carried on. Since the Rivers subdivision doesn't have a road running alongside it in the western part of the province, jumping from elevator to elevator meant driving L patterns across the landscape. All right, fine. Off I went to Norman. This elevator stands alone in the middle of nowhere, essentially. There is nothing around the elevator at all. This is a former UGG grain elevator now operated by Canada Malting Ltd. 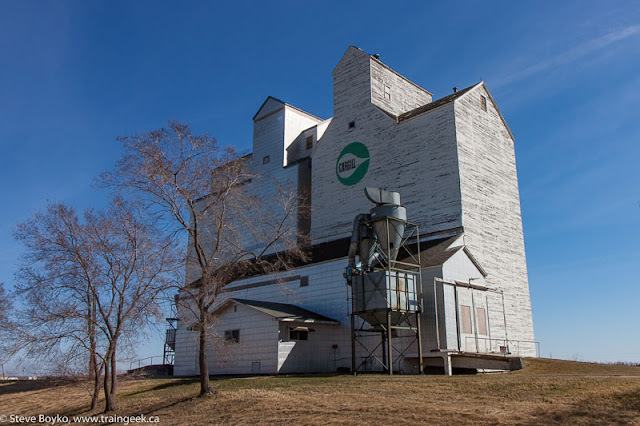 It looks like a close relative of another Canada Malting elevator in Mariapolis. At least Norman has rail service from CN. 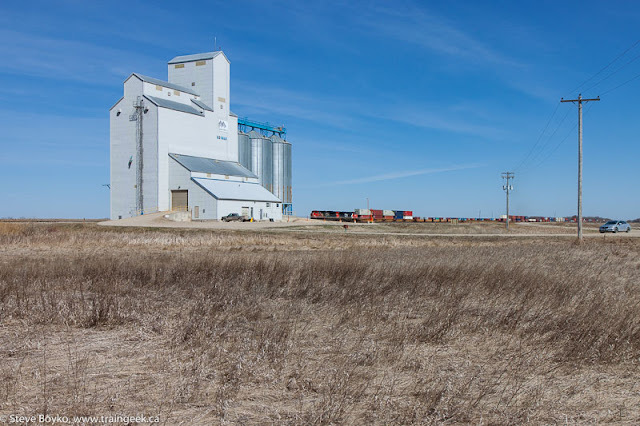 This is one of the newest wooden grain elevators in Manitoba. It was built in 1983 and started operating in 1984. I parked nearby and took a few photos. As I was walking around, I heard a distant train horn. Finally - a train! I set up the tripod with my iPhone on it, and stood by to snap pictures. 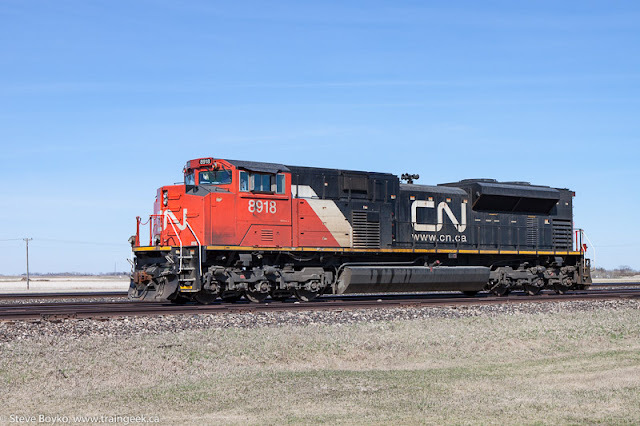 It turned out to be a westbound CN intermodal train led by CN 8961 and 2230. 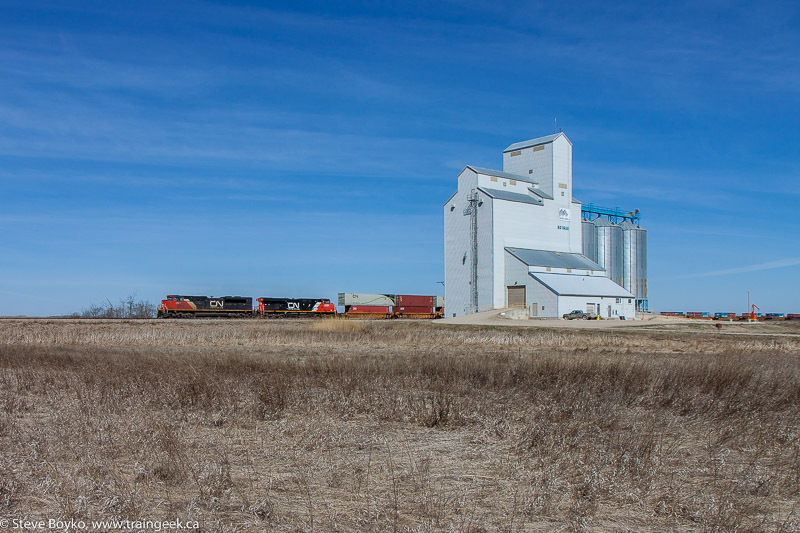 I was happy to stay a few minutes and shoot this train as it rolled past. I think there was someone working on this Saturday as there was a pickup truck at the elevator and I could hear some machinery working. This elevator has a capacity of 5,500 tonnes and has a single track with 23 car spots for loading and storage. Canada Malting's site has a page on it. Note the Oakner grain elevator is just visible on the horizon at right. After Norman, it was time for the namesake of the CN subdivision. The town of Rivers is a fairly busy place, with a population of a little over a thousand people. CN is front and centre with the namesake CN Rivers subdivision running through the town, and CN has a bunkhouse next to the former station. In the photo below you can see the grain elevator with the train station visible at far right. 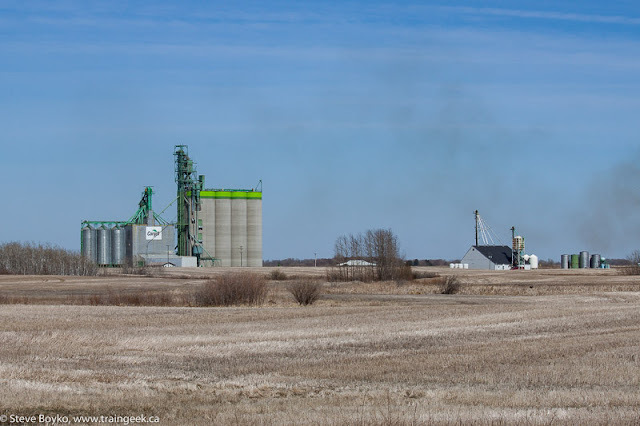 There are a pair of wooden grain elevators in town, labelled as Cargill and sharing a common driveway. It does not appear that Cargill still operates this elevator as it is not in Cargill's list of facilities. 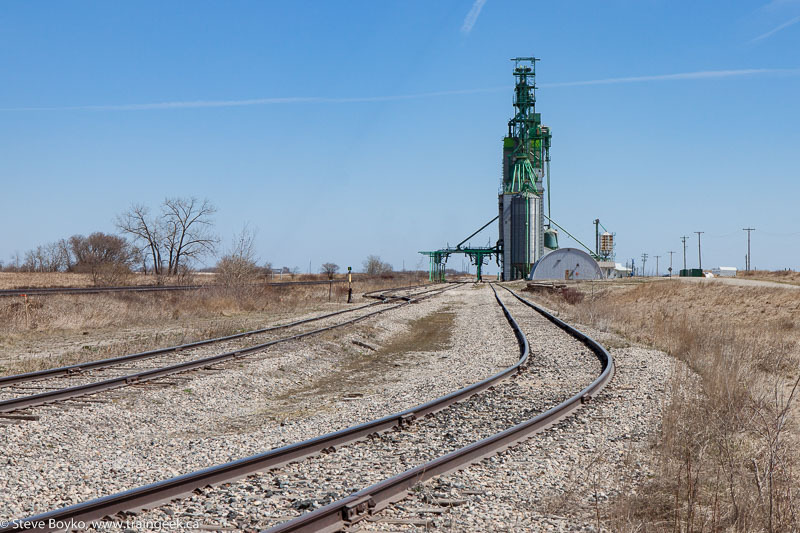 It appears that one was built in 1951 by National Grain and one was built in 1957 by UGG. I spotted a lonely CN 8918 sitting near the west end of the town. I'm not sure why it was there but it was nicely placed for a roster photo. I checked out the train station in Rivers. 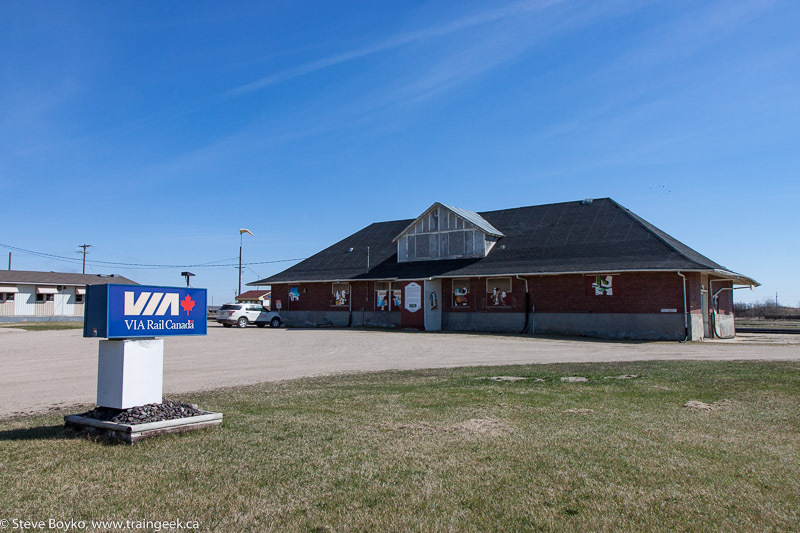 It looks like it is owned by VIA but appearances are deceiving. Notice that the station is not in great shape. The Rivers Train Station Restoration Committee has not posted on their blog since June 2014; however, I see they have received a $50,000 grant to repair the roof this summer and will receive $25,000 from CN for a "loco-labyrinth" / RV park. This is the actual VIA train station shack. Basically it is unstaffed and the passengers are on their own. VIA's web site strongly recommends that you reserve at least 24 hours in advance, and you have to bring your own luggage to the baggage car. This kind of stop used to be called a "flag stop" but I'm pretty sure you can't flag the train down any more. 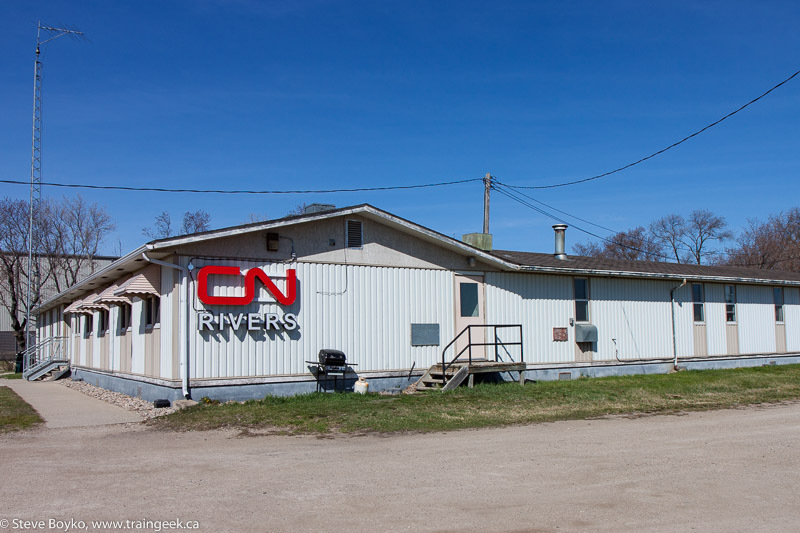 The CN bunkhouse is right beside the station. There is a CN boxcar and caboose on display nearby, as part of a park. Maybe the loco-labyrinth will be near here? I thought about getting take-out at the local Chinese food restaurant but decided that would take too long, so I bought a sub at a convenience store. While I was there, an intermodal train rolled through town but I saw the tail end of it. A CN engineer recognized me when I poked my head into the restaurant and messaged me on Facebook, so I went back to say hello and finally meet him in person. Hi Christopher! I would be back on the Rivers subdivision one more time this day when I visited Quadra. 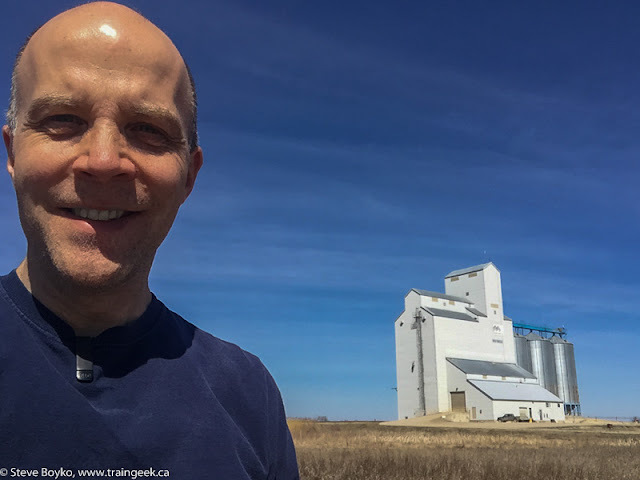 The other grain elevators in Manitoba on or beside the CN Rivers subdivision are at Elie, Bloom, Gregg, Harte, Justice and Knox and I had visited all of those before. That was it for Rivers... it was time to leave active tracks again and head for nearby Bradwardine and beyond. Great post! 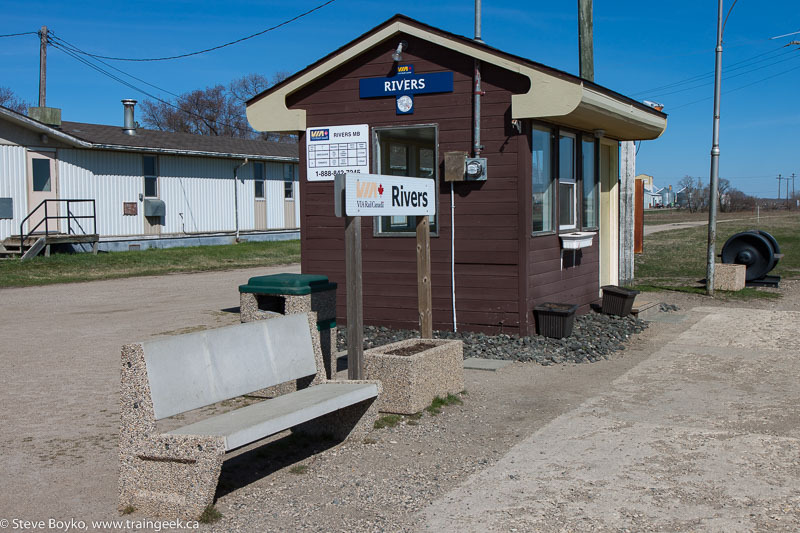 The Rivers VIA station closely resembles the one that used to be at Brandon North. I wonder if it's the same structure? Yes, this is the old Brandon North station, moved around late summer 2008 IIRC. Looks like they did quite a bit of upgrading to it after moving it here. I believe you can still "flag" the train east of Winnipeg. I flagged down the WB Canadian in Elma back in 2007, which was great fun!